I was fortunate to get the opportunity to spend 20 nights or 1 day short of 2 cruises on the Celebrity Reflection for its 11 night and 10 night Eastern Mediterranean itineraries (as a crew family guest). I boarded the ship in Civitavecchia, Italy (about 30 minutes from Rome on the regional train. I will blog about these destinations in separate posts. The ship is a work of art, a master piece. I was wowed by cruise ships a decade ago and did not think you could really improve them, but the Celebrity Reflection, less than a year old when I boarded it takes modern-luxury cruising to the next level. 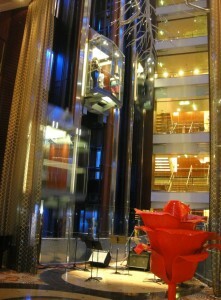 There are works of art spread throughout the ship, many with descriptors explaining the pieces. It’s an art gallery on water! This ship is solidly designed – minimal rattling or shaking (we did have a day or 2 of bad weather, but inside the ship I did not feel it). Top speed is 24 knots, although the maximum speed I encountered was 20 knots. 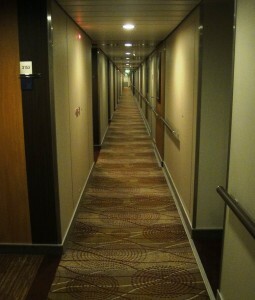 This is a tall, wide ship with guests allowed between decks 2 and 16 (although, similar to some hotels without level 13, and aircraft without row 13, this ship does not have a deck 13). The ship can carry just over 3000 passengers and 1200+ crew -a floating town! It has 4 engines, with 100% redundancy (in case one of the engines has to shut down) in an emergency, and it produces serious power! According to one of the engineering videos I watched, the ships air-conditioning requires 4.5 mega-watts of electricity when cruising in the Caribbean. My muster-station was on deck 5. This is where the life boats are situated and where I needed to go to for drills and if there is a real emergency on-board. It is reassuring to see how serious they take safety on-board, and how many crew emergency drills take place in addition to the mandatory guest emergency drill on the first day of the cruise. Deck 5 has nice chairs to relax on, to take in the fresh sea breeze and watch the waves at any other time. I had a nice stateroom starboard forward section on decks 7 and 11 (non-sea facing), and a sea facing room portside mid-ship on deck 3. As you can see below, in great condition (thanks also to the superb housekeeping team who make up the staterooms twice a day). My stateroom on decks 7 and 11 were nice and quiet, but you could hear the waves in the deck 3 stateroom (which can be relaxing). The only down-side to my stateroom on deck 3 was that at odd times I could also hear some of the machinery on the ship running underneath me (possibly air-conditioning or some extraction system) – but I did get used to the noise. The staterooms also have an interactive entertainment system delivered via the LCD panels which allows you to watch tv, movies and documentaries on demand (free and pay per view options are available), see your account balance, view professional photos taken of you on the trip, see the ships current location on a map, view from the bridge, make reservations and much more. The ship offers staterooms with private balconies and a variety of suites, some with a private butler service and a number of additional benefits – I can only imagine. Options and variety galore! I won’t be able to do justice in this section, except to just say that you will never be hungry aboard. The Ocean View Cafe restaurant is the main buffet restaurant on board where food and regular hot and cold beverages are served all day, free of charge. At each meal they serve foods from various nationalities including Asian, Indian, French, British and American. The restaurant opens at 5:30am with early-risers breakfast (running till 11:30am when late risers breakfast ends), lunch is served from 12pm-3pm, high tea is from 4-5pm, and supper from 6-9:30pm. Pizza, pasta, salads and desserts are available from early in the morning until 1am (free! ), gourmet ice-cream that runs till 10pm, and beverages are available 24 hours a day. Guests have the option of eating breakfast and dinner in style, in the main Opus dining room. In addition, there are a number of other bars, grills, casual and specialty dining restaurants offering food on the ship for a little fee. I used to love the coffee shop where you just pay for your drinks but all the desserts are free – that’s something I wish they had back at home. Another favourite restaurant was the Bistro on 5. Pay $5 and eat as much as you want (they served gourmet sweet and savoury crepes, soup, salad and tramezzinis). QSINE is a-bit hard for me to explain as it’s a new concept where they serve a number of international dishes, in special dishes in a very special manner (small dishes in a grid-like basket). Here are some additional pictures of some of the other restaurants on board. If you can’t get enough food in the restaurants, order room service! 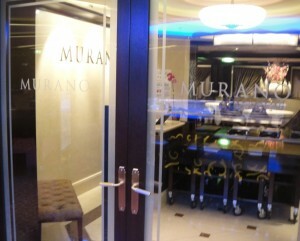 A number of free and premium meals served from 6am until 5am (23 hours a day). Serious thought has gone into the decision on what restaurants to have on-board, what to serve, and when to serve it. Why do I say this? Because the ship has published a thick hard-cover book showcasing the restaurants and offering some of the recipes that you can find aboard. If you want to chill-out and do absolutely nothing but watch the waves you have that option. Or, you can get involved in one of the on-board guest activities / competitions. Watch the Las-Vegas style shows with professional singers and dancers. Take a dip in the jacuzzis’ or swim in the outdoor pools or in the solarium. 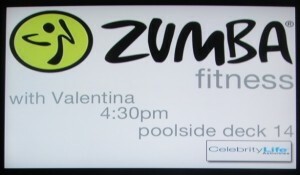 Visit the fitness centre / gymnasium (very large facility with equipment that matches or exceeds what you may find in your local health clubs) on deck 12. There is also a spinning studio, motion studio (with TREX ropes), another premium / private gym studio, saunas and professional trainers offering free and premium classes, workshops and training. It’s certainly interesting to do some of your balancing exercises while the ship sways a little. The only item, missing from the gym (perhaps for safety reasons?) was a step (those portable, plastic steps) which I prefer to use with a foam-roller (which was available in the gym). The ship also has a running track and basketball court on deck 14. Don’t feel like moving a muscle, then you can visit the spa. There is a “Persian Garden” next to the spa which I never get the chance to visit. The Sky Lounge is a nice quiet place to be in during the day when there are no private functions being held, but at night this becomes the night club. 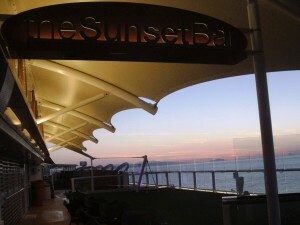 The Sunset Lounge, aft (the back of the ship) is appropriately named as you can take some of the best sunset photos from this location. The ship also offers picnic options on real grass at the top deck of the ship, a fully stocked library, and plenty of options for kids (a games room, “Teens Only” room, and many kids programmes). For those with a little cash, there are a number of gift shops in the promenade, an art gallery where you can purchase some fantastic pieces, and even an Apple Store! For those who want to take a bet, there is Fortunes Casino. At port you can remain on board where some activities are offered or book on one of the shore-excursions and get off the ship on a guided tour (or go out into town on your own – just make sure you don’t miss the ship and you are back on-board on time). Sometimes it’s just great to observe the day-to-day life and activities of the staff and operations on board the ship. They offer tours of the galley, on navigation, etc. But in addition it’s nice to observe the ship docking and departing at port, and the local pilots transferring on / off the ship. 3 weeks on-board, but certainly not enough for me! I got off the ship in Naples just after a quick lunch, and plan to spend a few nights on the Italian island of Capri. The Celebrity Reflection will be making a trans-Atlantic cruise to Miami in November and then offer cruises in the Caribbean for the next few months. This beautiful ship you sailed on is now in Caribbean waters for the European winter sailing out of Miami, USA to warm San Juan (Puerto Rico), St Thomas (US Virgin Islands); and St.Maartin (Netherlands Antilles) on seven day cruises. It will be back in Europe next year for the summer.